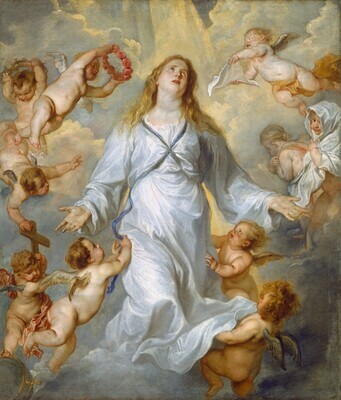 In this vivid image, Anthony van Dyck portrays the Virgin Mary gracefully ascending heavenward. With open arms and hands, she looks upward expectantly. Various putti surrounding her hold objects signifying Christ's Passion, among them the cross, the crown of thorns, and the veil. Another putto crowns her with a wreath of roses, signifying her role as intercessor for man's redemption. The word "rosary," the prayer beads used to aid in Catholic devotion, means "wreath of roses." Stylistically, this tender devotional painting is characteristic of the religious images Van Dyck painted around 1628–1629 just after he returned to Antwerp from an extended stay in Italy. His expressive brushstrokes reflect his careful studies in Venice and Rome of Titian, while his depiction of the Virgin with her upward gaze is reflects his familiarity with the work of Guido Reni, whose works he also saw in Rome. The subject also harkens to a painting Van Dyck had executed in 1624–1625 in Palermo. In that altarpiece, Van Dyck depicted the plague saint Rosalie being borne up to heaven to intercede on behalf of plague victims. The Virgin is the patron saint of Antwerp and Van Dyck has here revised his earlier composition of Rosalie ascending in this tender image of the Virgin as intercessor for mankind. Private collection, Antwerp, by 1670 until at least 1717. P. van de Copello, Amsterdam; sold 26 January 1774 to John Hope [1737-1784], Amsterdam; his estate, Amsterdam and London; by inheritance to his youngest son, Henry Philip Hope [1774-1839], London; by inheritance to his nephew, Henry Thomas Hope [1808-1862], London and Deepdene, near Dorking, Surrey; by inheritance to his widow, Adèle Hope-Bichat [d. 1884], London and Deepdene; by inheritance to her grandson, Henry Francis Hope Pelham-Clinton-Hope, 8th duke of Newcastle-under-Lyme [1866-1941], London, Deepdene, and Clumber Park, Nottingham; sold 1898 to (Asher Wertheimer, London) on joint account with (P. & D. Colnaghi & Co., London and New York); sold 13 December 1898 to Peter A.B. Widener, Lynnewood Hall, Elkins Park, Pennsylvania; inheritance from Estate of Peter A.B. Widener by gift through power of appointment of Joseph E. Widener, Elkins Park; gift 1942 to NGA. The Gallery's painting is shown hanging above a fireplace in a 1670 picture, Visitors at a Gallery of Paintings, by Hieronymus Janssens (Musée Girodet, Montargis, France). See J.W. Niemeijer, "De kunstverzameling van John Hope (1737-1784)," Nederlands Kunsthistorisch Jaarboek 32 (1981): 179, no. 67. Van Dyck's painting was seen by Sir Joshua Reynolds in the Hope Cabinet in 1781 (see Sir Joshua Reynolds, "A Journey to Flanders and Holland in the Year MDCCLXXXI," The Works of Sir Joshua Reynolds, Knight; late President of the Royal Academy, 3 vols., London, 1798: 2:363). For a detailed account of the Hope Collection and the family history, see Niemeijer 1981. John Hope's estate, which was left to his three sons--Thomas [1769-1831], Adrian Elias [1772-1834] and Henry Philip [1774-1839]--was administered by the children's mother, Philippina Barbara van der Hoeven and their father's cousin, Henry Hope [1736-1811], who ran the family firm. After the mother's death in 1789, Henry Hope assumed control of the collection of paintings in Amsterdam. In 1791 the three sons received the division of their mother's estate and a partial division of their father's estate. However the collection of paintings was not divided, but remained in the estate. On June 18, 1794, Thomas Hope, having attained his legal majority, received his inheritance, but he received no part of the collection, which remained in his father's estate, and which was taken by Henry Hope to London in 1794 when he and other members of the family fled the invading French army (See: Martin G. Buist At spes non fracta. Hope & Co. 1770-1815: Merchant Bankers and Diplomats at Work, The Hague, 1974: 42-43, 49; Niemeijer 1981, 166-169). In London Henry Hope was in possession of the collection. On December 17, 1795, he signed insurance lists of 'Pictures in the House No. 1 the corner of Harley Street, belonging to Mr. Henry Hope," (see J.W. Niemeijer, "A Conversation Piece by Aert Schouman and the Founders of the Hope Collection," Apollo 108 [September 1978]: 182-89). Included in the lists from catalogue B was "Van Dijck...Ascension of the Virgin...400," see: Buist 1974, 491. It is not clear when, and for what reason, Henry Philip Hope became the sole heir of the paintings, but he seems to have inherited the collection no later than 1819. After Henry Hope's death in 1811, possession of the collection presumably went to Thomas Hope, with whom it remained because of Henry Philip Hope's peripatetic life (see: Niemeijer 1981, 169). Thomas kept most of the paintings in his two London residences; first at 2, Hanover Square and, after 1819, off Portland Place in Duchess Street, where he designed and built a special gallery to house the collection (see: David Watkin, Thomas Hope 1769-1831 and the Neo-Classical Idea, London, 1968: 93). NGA 1942.9.88 was seen in Thomas Hope's Cabinet by C.M. Westmacott (British Galleries of Painting and Sculpture, London, 1824: 228). Henry Thomas Hope maintained the property and its collections on Duchess Street until 1851, when he moved to a new residence in Piccadilly (see: Niemeijer 1981, 170; and Ben Broos in Great Dutch Paintings from America, exh. cat., Mauritshuis, The Hague and The Fine Arts Museums, San Francisco, Zwolle, 1990: 422). Lord Pelham-Clinton-Hope lent the painting to the South Kensington Museum from 1891-1898. Date as mentioned in Widener card files, kept in NGA Department of Curatorial Records. However, Edith Standen recorded in her notes, in NGA curatorial files, that the painting was bought by P.A.B. Widener in 1899. A third source, Statement of Date of Acquisition and Cost of Items (...) Conveying the Widener Collection to the National Gallery of Art, kept in office of the NGA's Secretary-General Counsel, also indicates that 1899 was the date of purchase. British Institution, London, 1815, no. 120. Pictures by Italian, Spanish, Flemish, Dutch, French, and English Masters, British Institution, London, 1847, no. 25, as The Assumption of the Virgin. Pictures by Italian, Spanish, Flemish, Dutch, French, and English Masters, British Institution, London, 1865, no. 16, as The Assumption of the Virgin. Exhibition of Works by the Old Masters, and by Deceased Masters of the British School. Winter Exhibition, Royal Academy of Arts, London, 1881, no. 132. South Kensington Museum, London, 1891-1898, no. 68. Van Dyck as Religious Artist, The Art Museum, Princeton University, 1979, no. 36, repro. Anthony van Dyck, National Gallery of Art, Washington, D.C., 1990-1991, no. 47, repro. Van Dyck and His Age, The Tel Aviv Museum of Art, 1995-1996, no. 14, repro. Hofstede de Groot, Cornelis, and Wilhelm R. Valentiner. Pictures in the collection of P. A. B. Widener at Lynnewood Hall, Elkins Park, Pennsylvania: Early German, Dutch & Flemish Schools. Philadelphia, 1913: unpaginated, repro., as The Assumption of the Virgin. Paintings in the Collection of Joseph Widener at Lynnewood Hall. Intro. by Wilhelm R. Valentiner. Elkins Park, Pennsylvania, 1923: unpaginated, repro., as The Assumption of the Virgin. Paintings in the Collection of Joseph Widener at Lynnewood Hall. Intro. by Wilhelm R. Valentiner. Elkins Park, Pennsylvania, 1931: 54, repro., as The Assumption of the Virgin. Works of Art from the Widener Collection. Foreword by David Finley and John Walker. National Gallery of Art, Washington, 1942: 7, as The Assumption of the Virgin. Paintings and Sculpture from the Widener Collection. National Gallery of Art, Washington, 1948 (reprinted 1959): 77, repro., as The Assumption of the Virgin. Walker, John. National Gallery of Art, Washington, D.C. New York, 1963 (reprinted 1964 in French, German, and Spanish): 311, repro, as The Assumption of the Virgin. Summary Catalogue of European Paintings and Sculpture. National Gallery of Art, Washington, 1965: 46, as The Assumption of the Virgin. European Paintings and Sculpture, Illustrations. National Gallery of Art, Washington, 1968: 40, repro., as The Assumption of the Virgin. European Paintings: An Illustrated Summary Catalogue. National Gallery of Art, Washington, 1975: 120, repro., as The Assumption of the Virgin. Walker, John. National Gallery of Art, Washington. Rev. ed. New York, 1984: 252, no. 322, color repro., as The Assumption of the Virgin. European Paintings: An Illustrated Catalogue. National Gallery of Art, Washington, 1985: 144, repro., as The Assumption of the Virgin. Roy, Alain. Theodoor van Thulden: Een Zuidnedderlandse barokschilder 1606-1669. exh. cat. s'-Hertogenbosch, Noordbrabants Museum; Strasbourg, Musées des Beauz-Arts, 1991-1992: 190-191, fig. 89. Apostolos-Cappadona, Diane. "Virgin/Virginity." In Encyclopedia of Comparative Iconography: Themes Depicted in Works of Art. Edited by Helene E. Roberts. 2 vols. Chicago, 1998: 2:905. Wheelock, Arthur K., Jr. Flemish Paintings of the Seventeenth Century. The Collections of the National Gallery of Art Systematic Catalogue. Washington, D.C., 2005: 75-79, color repro.